Most transient birds are best seen in the spring, but there are a few that are more numerous in the fall. A few such birds are: Nashville Warblers, Orange Crowned Warblers, Yellow Rumped (Myrtle) Warblers, Oven Birds and Rose Breasted Grosbeaks. Though more colourful in the spring and easier to identify, part of the charm of fall bird watching is trying to identify juveniles and adults in fall plumage. While difficult, with practice it can be done and it certainly sharpens one's identification skills in the process. 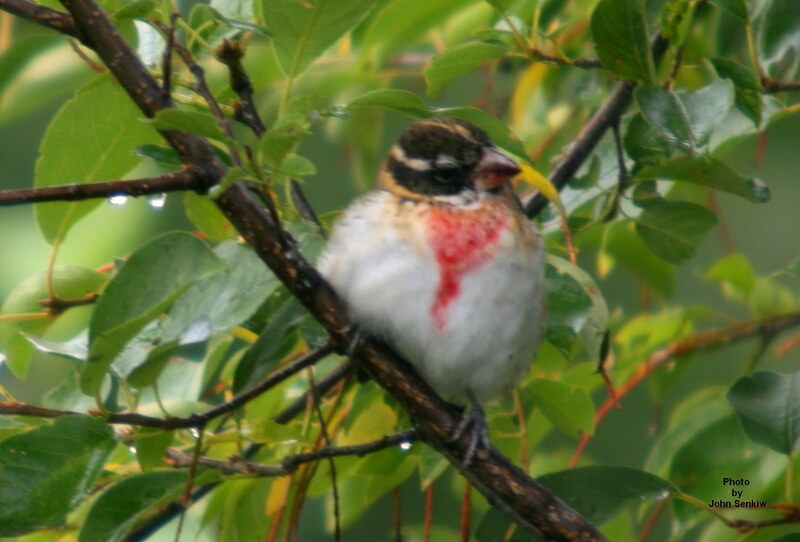 This week I am introducing a new family of birds, the grosbeaks. 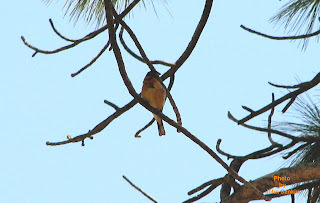 Related to sparrows and finches they have, as the name implies, large beaks attached to powerful muscles with which to crack hard seeds especially from evergreens. Like their cousins, grosbeaks will visit feeders making short work of the food offered them. For example, a flock of Evening Grosbeaks will consume a litre of sunflower seeds in a few minutes. Rationing is essential. It should be noted that the Pine Grosbeaks that I mentioned in Article No. 66 are not grosbeaks at all, but finches. Why the misnomer? Well, grosbeaks are generally larger than finches and have larger and more massive bills. Our largest finch, the Pine Grosbeak, looked more like a grosbeak than a finch and was so named. Properly, its name should be Pine Finch. Perhaps ornithologists will change it like they have changed so many other names in the last few decades. Some examples are: Rock Dove is now Rock Pigeon (the common pigeon seen around elevators); The Upland Plover is now the Upland Sandpiper; the Canada Jay is now the Grey Jay and so on. Time will tell. The first grosbeak chosen for these articles is the beautiful Rose Breasted Grosbeak that normally nests in the boreal forests of North America and seen here only in the spring and fall. However, with many plantings of evergreen shelterbelts some have started to nest locally. In the spring the males, with their black and white tuxedo-like plumage set off by bright rose coloured bibs, are simply stunning. This is one of only a few birds that is much more beautiful in real life than in a painting or photo. The females are brown overall with white markings and a distinctive broad white stripe that runs lengthwise along the side of the head just above the eye. Except for size (between that of a sparrow and robin) and a more massive bill, the females can easily be mistaken for female Purple Finches. They look like big and small versions of the same bird. In the fall the male Rose Breasted Grosbeak's colours are much more subdued but the bird is still easily identified. The rose bib is paler and the solid black head has the white stripe of the female. The females do not change colours in the fall and the young are much like the females with the young males showing some slight differences. The juvenile males will usually, but not always, show a little pink on the throat where the rose bib will eventually be. The best field mark to separate juvenile males from females is the pink under wing linings that all males have and that are very apparent in flight. The Rose Breasted Grosbeak occurs from the Atlantic to the Rocky Mountains where it is replaced westward by its very close relative the Black Headed Grosbeak. Where their ranges overlap they hybridize freely producing viable offspring. For that reason some taxonomists believe the two to be one species with two distinctive races. At present they are still considered two different species. Every few years a family group of the current year's hatch spends a day or two in our, and our neighbours', yards. This fall is one of those years. This week's photos are of a Rose Breasted Grosbeak taken in our backyard in the fall, and a Black Headed Grosbeak taken in the Cayumaca State Park in California. 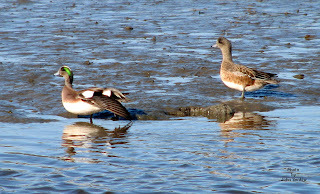 The fall male Rose Breasted clearly shows the striped head of the female. A few years back a male Black Headed Grosbeak spent a couple of days in our neighbourhood in spring. It was rewarding seeing a stray so far from its normal range. Too bad that I did not have a camera back then. Even though the weather has not been the best and I should be featuring some local bird, I would be remiss in not writing about the occurrence of the Magnificent Frigatebird at Fishing Lake this past July. I have seen many frigatebirds on both coasts in central Mexico, but to have seen one in Saskatchewan would have been something else. There is a better chance of seeing a full solar eclipse here (and with more predictability) than a reoccurrence of another frigatebird. Frigatebirds (there are five species worldwide) are related to pelicans and cormorants, but behave more like gulls than anything else. Like pelicans and cormorants they are fish eating birds that have four toes joined by webbing, but have little else in common. Like gulls and terns, frigatebirds like to steal food from other birds, ironically from gulls and terns. Their speed and agility make piracy possible. Contrary to what has been written in some articles, frigatebirds feed themselves primarily by flying low over the water and plucking fish, turtles, jellyfish and birds on or near the surface - at least according to the Sibley and Smithsonian field guides. Though seemingly capable of swimming they never do, preferring to rest on trees, poles and so on. The Magnificent Frigatebird, meaning: the Great War Vessel, is a goose sized bird that is mostly wings and tail. The body is actually quite small. Although it is about forty inches long and has a ninety inch (over seven feet) long wing span it is only about three pounds in weight, about the same as a good sized mallard. In fact it has the longest wing span in proportion to body weight of any bird in the world thus making it a buoyant and tireless flier. The tail is forked, but this can only be seen when the bird brakes in the air, otherwise, it is folded into a point. They are known wanderers having been recorded as far inland as Colorado and as far north as Newfoundland now, as far inland and as far north as Fishing Lake, Saskatchewan. The colours are also quite distinctive. Unlike most of its relatives, the males and females are different. The males are all black save for a bare red throat that can be greatly inflated during breeding season; the females, like the one seen at Fishing Lake, are all black with a white breast; the juveniles are all black with a white head and breast. The juveniles change little for three years after which the males and females start to differentiate. Then, it takes at least two more years before they reach maturity. In one article about the Fishing Lake sighting, the writer speculates that the bird must have been a youngster that got lost somehow. However, according to the experts, this bird must have been at least five years old - hardly a beginner. Why would an adult stray so far from the tropics? Did it have an unhappy childhood? Nobody knows why it strayed, but everybody is sure glad it did. Since I do not have a picture of a Magnificent Frigatebird, I decided to do a "minor feature" of a bird that is very common around here, especially in the spring. The Willet, formerly known as the Western Willet, is a crow sized, grey wading bird with a long, stout, straight, black bill. When wading the shallows it can only be described as nondescript. However, when it takes flight its field marks are diagnostic. The wings are a sharply defined black and white running the full length of both surfaces of the wing. 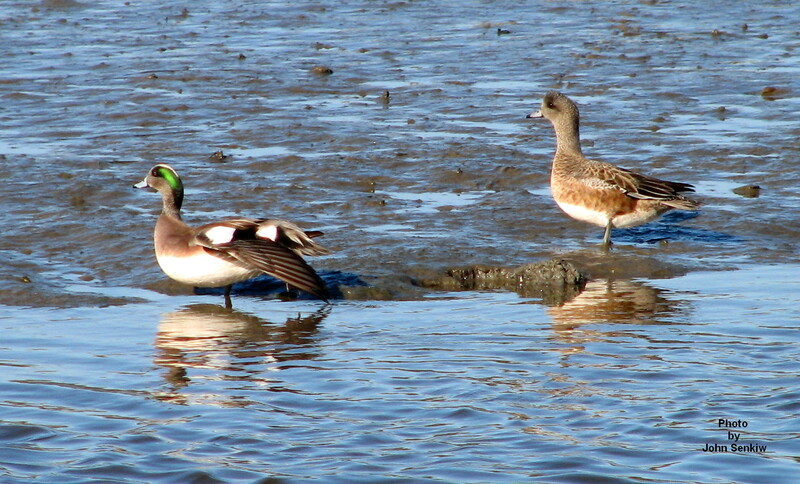 In addition, its vocalization in flight is a loud and unmistakeable "pill will willet". When it lands it tends to keep its striped wings upraised for a second or two giving a viewer a second and better look. In summary: in flight, the bird is easy to identify; on the ground, not so much. Getting this week's picture was a story unto itself. 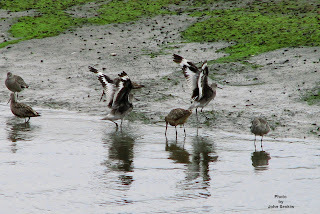 While birding in the San Elijo lagoon in California, I watched a small flock of Willets feeding on either side of a lagoon creek during low tide. Every few minutes a Willet or two would fly from one side to the other with their distinctive wing patterns begging for a picture. I would focus the camera on a calculated (guessed at) landing spot and hope for the bird to land there and to hold its wings upright long enough for me to get a picture. I suffered "umpteen" disappointments, but I did manage to get two good photos and decided to use the one with two birds in it. (Two is better than one?) In addition, there are two other Willets and three Marbled Godwits in the photo. Try to identify them. Answers in the next article.